Should you choose airbrush on your wedding day? We are passionate about achieving the end result look you want and we will stop at nothing to ensure that you look like you, on your most beautiful day. The decision to choose traditional over airbrush should not be based on price, but determined after your artist evaluates your skin type and condition and you choose the type of coverage and texture you like. That’s right, there is not a price difference between the two. How can you choose which is best for you without a greater understanding of what each of foundations are? Texture is liquid, cream or powder. Is applied with a brush or a sponge. Coverage is determined by the actual formulation itself and can be sheer to full coverage. Traditional Foundations generally do not last as long and may not withstand some environmental conditions such as the 100-degree temps that Las Vegas has to offer. Texture is consistency of skim milk. Applied with an airbrush compressor and counterpart tools. Coverage can be adjusted from sheer to full coverage. Transfer and water resistant, 15+ hours of wear, can be custom blended and can cover the neck, décolleté, arms and back. Airbrushing refers to not only to the application of foundation, but the physical formulation of the foundation as well. To help gain a better understanding of what you’re booking or in some instances paying for, ask your artist what type of compressor they use and if they use actual airbrush foundation. Only an airbrush compressor that allows the artist to control the PSI is a professional compressor. Infomercial brands don’t have the airflow needed for smooth, even coverage. They’re also not made for commercial use so are likely to break and stop working when the motor gets hot from extended daily use. Certainly not what you want on your wedding day!! Foundations also need to be made specifically for an airbrush compressor. All too often I see inexperienced makeup artists use a traditional foundation and “base it down” with water or some other liquid in an attempt to make it thin enough to pump through the compressor. First, when liquid is added to foundation it’s chemical composition is changed. This causes the inexperienced artist to use several “layers” to get the result/look needed for photos. Hence what should be weightless has now become the feeling of a pancake on a client’s skin. Even coverage is gone and any texture on the skin becomes exaggerated and glaring. For an artist the tools and training to perform quality airbrushing services for a client are an ongoing cost. In fact, very expensive cost. Makeup in the 702 spares no expense to provide quality, long lasting results and deliver a magazine cover perfect look to our clients. Want to experience this on your wedding day? Previous Previous post: 3 reasons to choose a professional hair stylist and makeup artist for your wedding day. 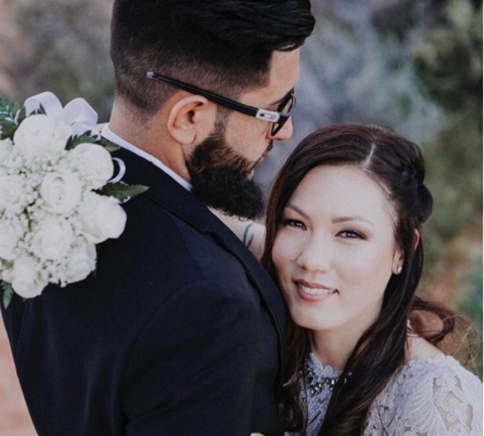 With a strong background in Fashion and Beauty and all things love, Megan brings together the top 1% of hair and makeup artists in Las Vegas, so our brides have what they deserve- the best of the best.